The World's Largest Starbucks is Being Built in NYC, Can We Move Now? I am here to inform you all that the festering tourist trap featured in your Manhattan-related dystopian nightmares is now going to be a thing, because the largest Starbucks in the world is officially opening in NYC’s Chelsea neighborhood. What makes this news even better? The company has described the intended retail location as an “Eataly-style” joint, which makes me think that Starbucks is like an out-of-towner with the preconceived notion that all New Yorkers spend their weekends hanging out in the M&M Store in Times Square. According to a press release issued by the company, Starbucks’ coffee-scented take on the Tower of Babel is set to open at 61 Ninth Avenue in the Meatpacking District, and will take over a 20,000-square-foot space previously occupied by a lumber store and warehouse. 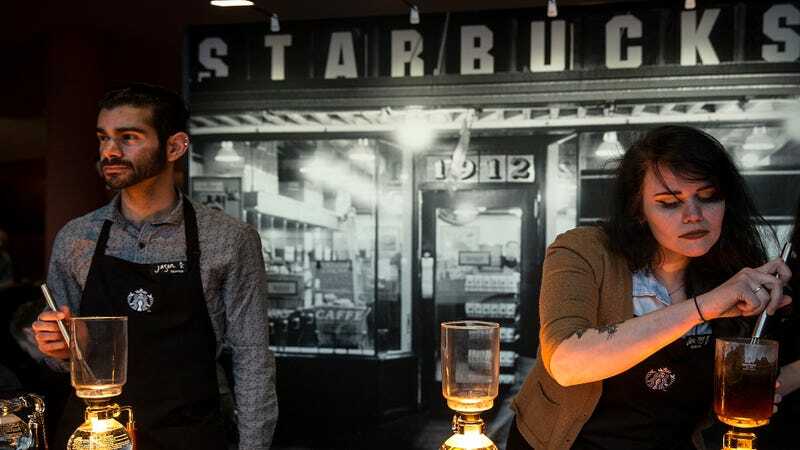 “A local sensation since opening its doors, the Roastery is coffee as theater, encouraging customers to interact with Starbucks roasters and baristas in order to deepen their understanding of the art behind sourcing, roasting and brewing rare coffees. With Starbucks unique, small batch process taking center stage, the Seattle Roastery has transformed specialty coffee and reframed what is possible to do within the four walls of a retail environment. I also forgot to add that it will be right across from a pre-existing Starbucks, because of course. In conclusion: hi New York, this is from me to you.